To complete the American Mountain Guides Association training and certification program requires over 80 days of contact time with qualified instructors over a period of years while gaining relevant experience in the guiding industry. To become an American Mountain Guide requires training and examination in the three disciplines of guiding. Guiding Experience – Geoff has over 15 years of guiding experience and gained his IFMGA/American Mountain Guide qualification in 2008. Geoff has worked as a guide in North and South America, Europe, and Asia. Climbing Experience - Geoff Unger is a professional climber with over 20 years experience including difficult traditional climbing, expedition climbing and big wall experience. He has climbed first ascents around the world and made significant winter ascents in the Alps. 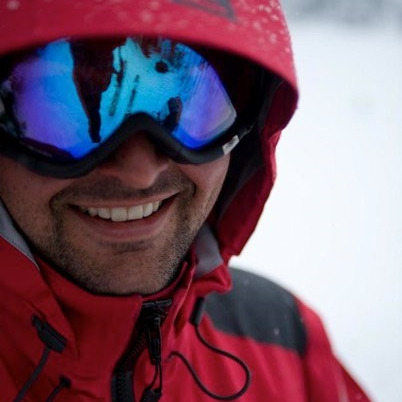 Geoff is an AMGA Instructor Team Member, an AIARE Instructor and a professional member of the American Avalanche Association(AAA). In addition he is a founding member and president of the Certified Guides Cooperative(CGC) a not for profit guides cooperative providing access to permits, insurance and other services to AMGA Certified Guides in the United States and abroad. SERVICE – Geoff has owned and operated his own guide business since 2009. His focus is on creating high quality experiences based on direct contact with his clients before the trip then hands on training and coaching in the field. Whether you are new to climbing or an expert Geoff has something to offer you to help you progress as a climber or reach the summit of your dreams. INSTRUCTION – Geoff is a committed climber, coach and mentor. In addition to guide training, certification and continued professional development, Geoff is a top level instructor and coach. He brings his years of experience to his coaching helping climbers and skiers to move with more fluidity through the terrain. Geoff serves on the board of directors for the American Mountain Guides Association and the Certified Guides Cooperative. He leads the Certified Guides Cooperative as President and Administrator. On the AMGA board he is the chair of the Professional Compliance Committee. Community – Geoff is a well known climber and guide. In each area where he guides he connects with local guides and is sensitive to local issues. Environmentalism – Geoff is a Leave Not Trace Trainer. He models and teaches environmental sensitivity to his clients through LNT. Service – Geoff makes a difference in the climbing communities where he climbs and guides. He has volunteered countless hours to anchor replacement and trail maintenance over his career. Geoff is a long time member of the American Alpine Club and has contributed to the American Alpine Journal. He also donated to the fund for the Gunks Campground project. Access Fund – Geoff is a member of the Access Fund and supports its mission to preserve access for climbers in the United States. The Certified Guides Cooperative (CGC) works hard to develop and maintain relationships with land managers . Geoff is instrumental in promoting and modeling stewardship through his work with the Cooperative. Geoff is committed to preserving the lands where he operates. The Mohonk Preserve is no exception. Geoff teaches his clients to respect the land by modeling and coaching environmental best practice. Geoff is a authorized to guiding on the Mohonk Preserve as an individual guide. He holds one of the four available permits for individual guides in the area. Extreme Alpine is the guide service owned and operated by Geoff Unger. Geoff is an American Mountain Guide based in Rosendale, NY. - Click the ABOUT link above to learn more.